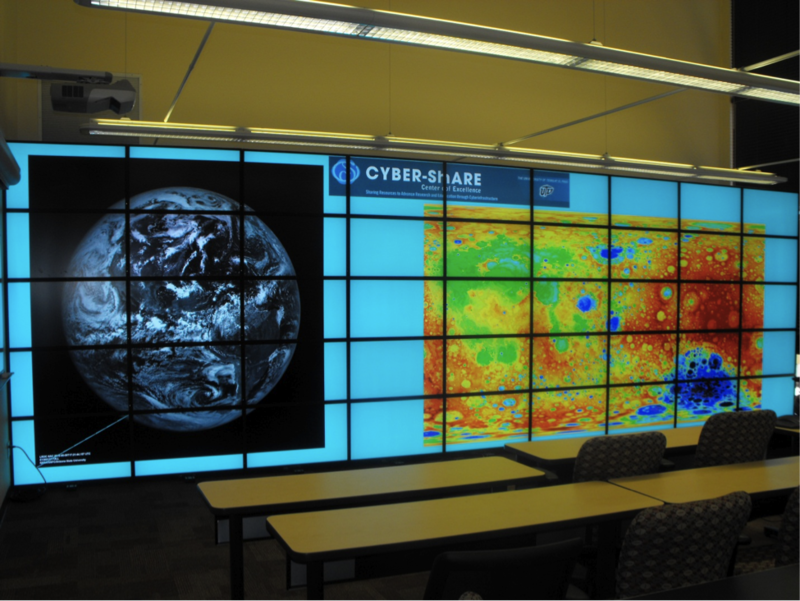 The NSF-funded (MRI-0923442) Cyber-ShARE Collaborative Visualization System (C2ViS) will be used to present high-resolution displays of scientific datasets for exploratory, monitoring, educational, and outreach purposes. The core of C2ViS is a tiled-display system comprising a 45-monitor display matrix driven by 45 workstations which are interconnected by a high-speed network. C2ViS will support both local and virtual organizations; it will be used by educators and researchers in science, engineering, math, and technology; and it will serve as a resource for city and county government entities, as well as regional school districts. C2ViS will support a variety of exploratory applications including visualization of tomography models of the subsurface of the Earth; spatial surface datasets from the geosciences and environmental sciences communities; and 3-D solid models for advanced material fabrication, tissue engineering, and biomodeling. Geosciences and environmental modeling will include the visualization of datasets measured or modeled in near-real-time. Numerous UTEP courses will incorporate C2ViS into their practicum, including those offered by the computer science, geosciences, environmental science, computational science, biomedical engineering, and other science and engineering programs. The College of Engineering Excellence in Technology, Engineering, and Science Summer Institute, the College of Education Mother-Daughter/Father-Son program, and the College of Science NSF-funded Pathways to the Geosciences program will use the C2ViS to motivate K-12 students by involving them in scientific discovery through visualization. To get updates about C2ViS-related projects, visit the C2ViS facebook page.